Beautiful 2 Bedroom, 2 Full Bathroom Home. PLEASE read all info about the rental, to ensure a pleasant stay. 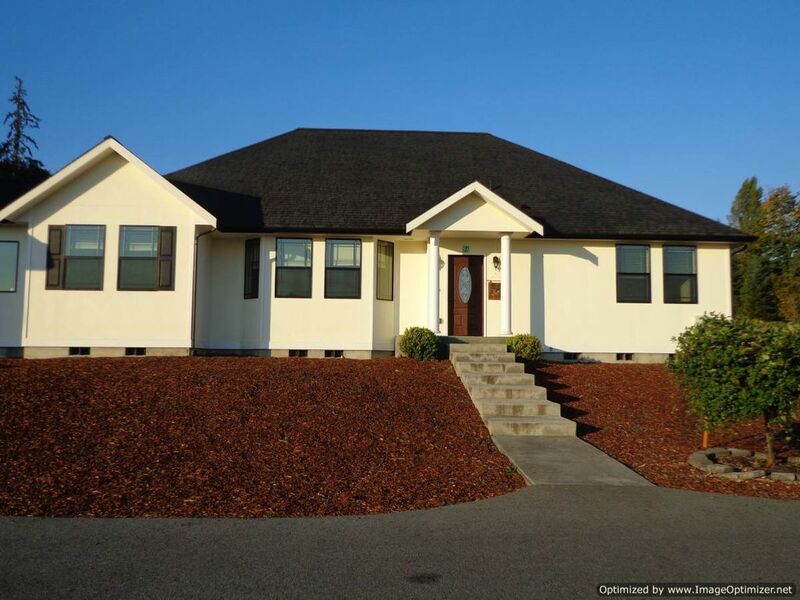 94 Baker Farm Road Port Angeles Washington,Beautiful vacation home in peaceful setting. Master bedroom, queen size bed plus a queen size futon, with large walk in closet and large bathroom. Second bedroom with two twin beds, and large closet. Twin size roll away bed stowed in closet for use if needed. Port a cribs and high chair available upon request. Second bathroom has tub/shower combo. Fully equipped eat in kitchen, with basic food items provided. Large living room, with TV for the DVR player. Den with games and toys and amazing books. Laundry room with needed supplies. Home sits on farm like land with a view of strait of Juan de Fuca and Canada. Quiet setting within a 1/4 mile of horse and ATV trails. 5 miles from city limits, 7 mins from ferry to Victoria Canada. Internet access in guest home. 3 miles from a large grocery store and gas station. The vacation home is a completely separate unit from our main home. It is joined only by a enclosed walk way which will remain locked during your stay. There is a dog on the prop. We have a lock box system to get into the home. IF this is need for you to access the home we will send you the code. In the kitchen there is a notebook with the house rules, please review them first when checking in. We change the code with each new guest. Parking is in front of the home, north side. Please park in front of the rental home by the steps. Only one car can be parked there. If you have a second car you can park in the back of the home by the garage. All children must have an adult with them when outside on the prop. Call 2 hours before arrival. The phone number is provided when you book the home. please pre advise owner of any guest that will be with you on the property during your stay. NO PETS of any kind. No smoking anywhere on the property. Also PLEASE call owner at 360_477_6934 or 477 9810 at least two hour prior to arrival for check in. Check in after 2pm.Check out 10am If we are unable to check you in, you will be sent a code for the lock box on the front door of the rental. The front door is on the north side of the home(waterside). The numbers on the box needs to be spun from top to bottom to set your code. Line the number up in the middle of the dial, then the whole from of the lock box will open. When checking out leave the key on the kitchen counter. dead end rural road that leads to hundreds of mile of trails for ATV or horse/hiking. 7 miles to ferry. 5 miles to city limit. View of Victoria Canada. Quite setting. Close to town. Trails for motorcycle, horseback riding or hiking. Thank you again for another great stay and all of your hospitality. We will see you again next year for sure! The place is kept clean and well-maintained. It looks like it's been remodeled recently. The property surrounding looks very quiet and peaceful. You can easily spot deers running around in the front. Additionally, having the owner next door felt safe. Overall, it was very nice stay. Thank you for your kind words. Glad you enjoyed your visit. We spent Labor Day weekend at this Port Angeles property and loved it. Super clean and very convenient to all of the fun places to explore on the Olympic Peninsula. Lovely, quiet setting. Thank you for your kind words. Hope to see you again. This is a spacious, clean home. I appreciated how stocked and functional it was, especially after a long day of travel. It was very quiet and easy to reach from town. The hiking trail just down the road was a nice bonus! I will definitely stay here again. Owners are very responsive. Check in/out was easy and straight forward. Thank you for your kind words. Glad you enjoyed your stay. Loved every minute of our stay. Highly recommend. Loved the deer that made their appearance. Relaxing visit. Great communication. Clean, comfortable house in a quiet, pretty setting, convenient to town and NP. CHECK IN by calling 360 477 6934 one hour prior to arrival. So owner can meet you at the home.